HBI–Hezkuntza Baliabide Irekien gaineko hausnarketa oinarritzat harturik, postak interneta tajuz erabilteko bitartekoak batzen ditu: besteak beste, argazki, podcast eta bideo errepositorioak. Baliabideak atontzeko Pearltree bat erakusten du. El post se basa en una reflexión sobre REA–Recursos Educativos Abiertos y reúne medios para utilizar la red adecuadamente: entre otros, repositorios de fotos, podcasts y vídeos. Propone un Pearltree para ir ordenando todos los recursos. and that the intellectual Property System has been perverted, we also defend the importance of protecting the hard work others do and think our students have to learn which sources they can use freely and which ones cannot be used according to the current copyright laws. Indeed, not everything can be taken from the Internet and be reproduced or used, specially if no reference to its author is made. We teach in a foreign language which means that very frequently we look for resources in countries ruled by a different copyright law other than the local one. Then, which copyright law are we bound by? As both the USA and Spain signed the Convention, I understand that I should follow the Spanish one and COULD finally use Parisi’s cartoon. Hmmmm… I could but bearing in mind that the author doesn’t want me to do so, I shouldn’t. Our students are at school now but will leave it soon. Then, no educational exceptions will apply when they need to borrow others’ creations. 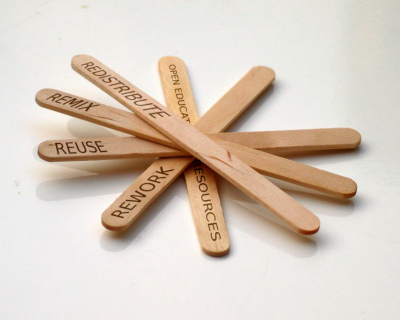 So, how can we help them reuse and remix respectfully and efficiently? Where can students find all the documents they need for their assignments or presentations now and once they’ve finished studying (although you never do, do you)? Besides, where can we look for ready-to-use resources to prepare our lessons, design our webquests and treasure hunts or build our internet site? And what about licensing the resources we all create? Can we contribute to creating Free Cultural Works by choosing an Attribution or an Attribution-Share Alike license by means of Creative Commons? A previous post, Seaching the Net gathered several hints on how to narrow queries and assess the reliability of web sites. Now, find hanging from the Pearltree below several open repositories of books, images, clipart, videos, courses and software as well as information about the Public Domain, Free Cultural Works and the Commons which can help students gain an insight in their learning to learn skills and their digital literacy. Moglen, Eben. “The System of Ownership of Ideas.” clo­sure con­fer­ence of the Mas­ter on In­tel­lec­tu­al Prop­er­ty. International Training Centre. ILO Turin Conference Centre, Turin. 17 Dec. 2004. Lecture.